Blue is a very festive appropriate color and especially looks magnificent as a bridal color. Shades of blues have been trending greatly in the bridal fashion and it is the type of color that looks flattering on everyone. 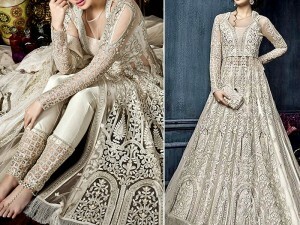 This chiffon dress is a very affordable of a designer suit and with such accurate color selection, plus detailed embroidery, it is hard to find a better dress at this cost, elsewhere. 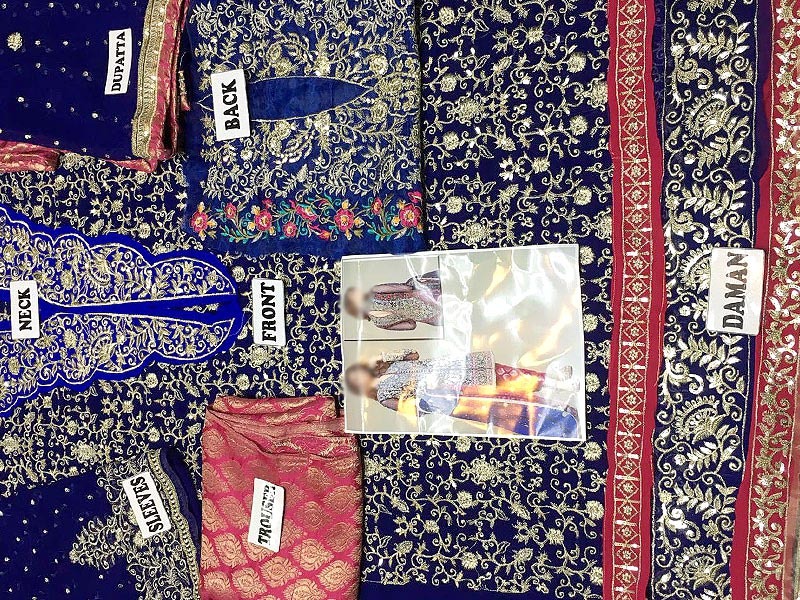 The Embroidered Blue Chiffon Bridal Dress has an oxford blue, richly embroidered shirt with an oxford blue colored dupatta, along with a tea pink jamawar trouser. 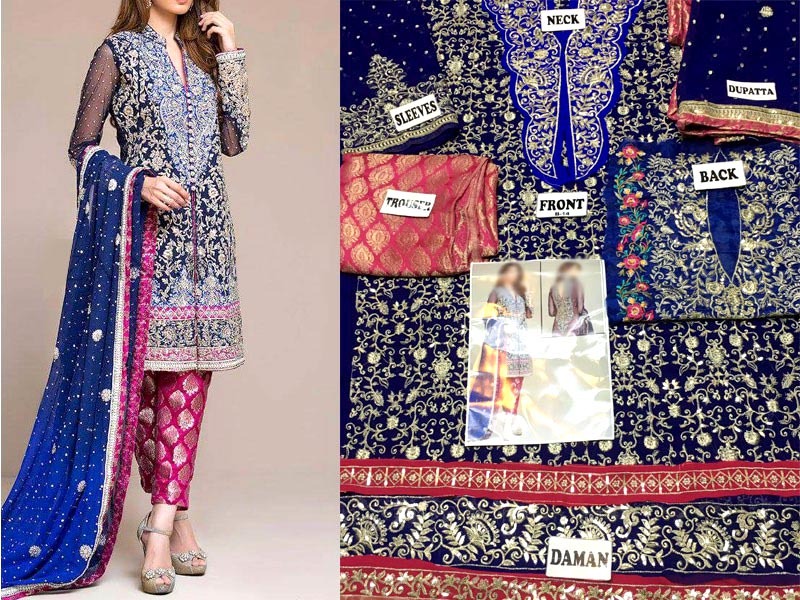 Zari with sequins work along with banarsi trouser are the main styles of embroidered done on this Pakistani bridal dress, plus the pink border panels for the shirt is what makes this suit so eye-catching. The shirt and dupatta have a complete traditional floral embroidery in hues of light gold color, plus the gold sheen accents of the jamawar make this suit utterly gorgeous. Embroidered Blue Chiffon Bridal Dress Price in Pakistan (Code: M009034) offer by PakStyle are just Rs.2895/- instead of Rs.4000/-. 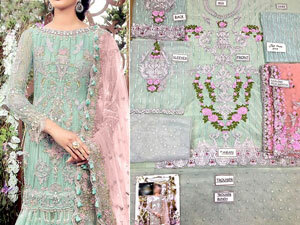 Buy Embroidered Blue Chiffon Bridal Dress Online in Pakistan and variety of other products like Womens Clothing, Womens Dresses, Chiffon Suits, Blue Wedding Dresses at PakStyle.pk and enjoy Fast Shipping with Free Home Delivery in Karachi, Lahore, Rawalpindi, Islamabad, Faisalabad, Hyderabad, Quetta, Peshawar, all across Pakistan and get it delivered in 1-4 working days.